Steven has been searching for Hidden Mickeys since he discovered his first one in the early 1990’s. Armed with a camera, a pen, research material, and probing curiosity, he braves the detailed Disney terrain to document and catalog the hundreds of wild Hidden Mickeys lurking throughout Disney property. The HiddenMickeyGal joins in the fun with social media postings and helping organize Steve's collection of over 4,750 Hidden Mickeys including over 25,000 photos. Have you discovered a Hidden Mickey that you’re willing to share? We welcome and encourage submission of your Hidden Mickey sighting(s)! I’ll review your descriptions (and photos) for potential inclusion on this website and in my Hidden Mickeys books and apps. 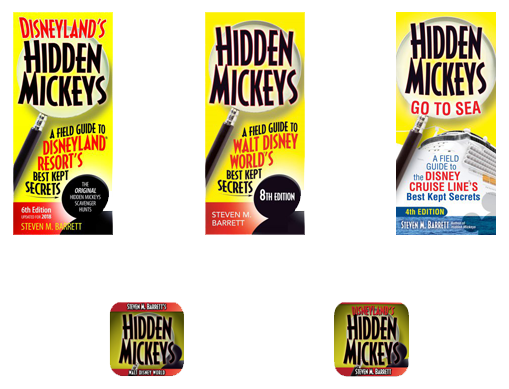 If you’re among the first to submit a Hidden Mickey that is accepted, I’ll mention your name (if you wish) in the website post and in the Acknowledgements section of the Hidden Mickeys books. Please feel free to submit your Hidden Mickeys from anywhere in the world: on Disney property or off - movies - nature - pets - and beyond!